Eagles linebackers Jordan Hicks (right) and Nigel Bradham going after Carolina running back Christian McCaffrey on Oct. 21. Stop the run and have some fun. The fun Wilson is referring to isn't a postgame party at the SugarHouse Casino. It's forcing opposing offenses into third-and-longs and then teeing off on the quarterback. Stopping the run will be particularly essential Sunday night when the 4-4 Eagles host Ezekiel Elliott and the 3-5 Cowboys at the Linc. Elliott is the straw that stirs the Cowboys' offensive drink, as diluted as that drink has been this season. He is fourth in the league in rushing with 680 yards. Beating the Cowboys starts — and often ends — with neutralizing Elliott. Elliott has been stuck in neutral a lot lately. He has averaged just 3.3 yards per carry in the last four games. It's no coincidence that the Cowboys have lost three of those four. Ezekiel Elliott (21) has rushed for 680 yards this season. The Eagles are second in the league against the run this season, allowing just 83.8 yards per game. But that number should have an asterisk by it. It's more a reflection of the fact that nobody is running the ball against them than anything else. They are actually 21st in opponent rush average (4.5 yards per carry). For the second year in a row, they are averaging the fewest opponent rushing attempts per game in the league (18.1). Not one of their first eight opponents has run the ball more than 23 times against them. Five have run it 18 times or fewer. Unless the Eagles jump out to an early lead, something that has rarely happened in this Season of the Slow Start, the Cowboys will be handing the ball to Elliott early and often. When teams didn't run the ball much against the Eagles last year (a league-low 21.1 carries per game), it was attributed to the fact that they usually were playing catch-up. The Eagles had the biggest first-quarter point differential (plus-58) and the third-most first-half points (14 per game) in the league. That hasn't been the case this year. The Eagles have been outscored, 29-21, in the first quarter and are averaging a puny eight points per game in the first half. Despite that, teams still aren't running on them. "I appreciate that,'' Graham said with a smile. "But we always have to stay ready. Every team is different. Elliott isn't the Cowboys' only running threat. 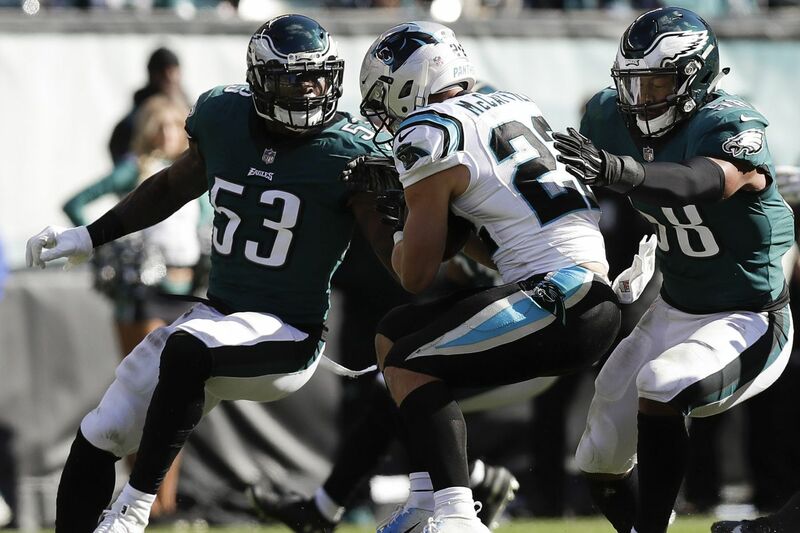 The Eagles also have to be aware of Prescott, who is averaging 5.9 yards per carry and has 16 rushing first downs, which is the fifth most in the league among quarterbacks, behind only the Panthers' Cam Newton (28), the Jaguars' Blake Bortles (20) and the Titans' Marcus Mariota and the Bears' Mitch Trubisky (19 each). The Eagles have faced a slew of running quarterbacks already this season, including Newton, Bortles, and Mariota. The three of them combined for 138 yards and eight first downs on 25 carries. In their last five games, 30 of 96 rushing attempts against the Eagles have been by quarterbacks. The Cowboys are averaging 5.2 yards per carry on first down, the fifth-best first-down rushing average in the league. The Eagles, meanwhile, have struggled defensively on first down. They are 21st in opponent rush average on first down (4.51), which is up dramatically from last year, when they held teams to 3.37 yards per carry on first down, which was the league's third-best mark. Overall, the Eagles are 26th in first-down defense (6.41 yards per play). Last year, they held teams to a league-best 4.26 yards per play on first down.